Apparently a Bind on Equip world drop which can be found from high-level mobs and/or trash in raid instances, like Blinkstrike was in TBC. Dropped for us in Naxx10 trash, probably a world drop but not totally sure due to some other trash drops there being BoE aswell. Dropped for me on a Lvl 80 Cult of the Damned mob in Icecrown as well today. I'm gonna guess Dragonflame is right about it's drop locations. Just got one in Storm Peaks, so yes, it is a world drop. Found this in Halls of Lightning on Heroic. Sold For 7k even. i got this on my rogue in heroic UK, i was lucky enough to be the only person in the group who could use it. Got this from runesmith in icecown. This is a nice sword and all, but not worth the amount of money that some would be selling it for. The grasscuter for marks is just a tad off of this sword, but 50 marks is very easy for anyone in decent BC gear to get running heroics. If this sword drops, great! But would save the money. One dropped for me yesterday off a level 79 Wailing Winds in Frostfloe Deep. Wishing I could find a second one to dual wield these. The Savage Cobalt Slicer is slated for ner#$%e in 3.0.8. Considering you're comparing a lvl 74 required crafted item to a lvl 80 required drop, I guess it shouldn't be a surprise. Hunters can dual wield a 2-handed weapon? "of Jin" seems to be a reference to Jinn (Genie), which is, in Islam the closest equivalent to what we know in English as a Demon. A pretty fitting name for this sword, and the look of it I'd have to say supports this reference. Dropped today off trash in regular COT: Stratholme on Runetotem. Sorry boys, this one isn't going to the AH. Dropped last night from nax trash on the way to Noth. I wouldnt mind two of these on my hunter. True, Rogues are all about specials but don't neglect that off-hand weapon. Err, no. Dual wielding white attacks have the same hit penalty, your offhand doesn't miss any more than your main hand. And as stated above, hit is still a decent stat, but you shouldn't even gem for it. EDIT: I love how I'm getting voted down but not replied to, where's your evidence that I'm wrong? Ask any rogue Elitist Jerks and they'll tell you about EP weights and how hit isn't that great. An excellent sword. 10 man combat Rogues will not see a better off hand than this until they get to Malygos. it dropped for me in violet hold - greeded it - won it and after 1 hour sold it for 1800g in ah. I just bought this, and perusing the other offhand swords available, I'd agree. The 1.5 speed, coupled with its nice stats made it a worthwhile purchase. A guy was selling this in the dalaran trade chat, he asked me if i was interested, i thought he was a officer from AsOj (a guild on my server) note that the intial letters of this sword is AsOj, i said yes, he spammed me for four hours, you buy now? You buy now? You buy now? You are wrong, any rogue that has ever run Recount will tell you that about 70% of all damage comes out of white damage. Go to www.maxdps.com and see which weapons are valued more. All of the items on maxdps are listed in accordance with the shadowpanther.net spreadsheets. And yes, I voted you down. Stick with 2x Savage Cobalt Slicers hunters (At least until 3.0.8 comes out). This isn't worth it for us. What does your melee weapon speed have to do with AotV regen. It's your ranged weapon speed that regen is scaled based on, unless you're playing the melee huntard roll. P.s Thanks for the rate! I was happy to write my first post in there..... Are you jealous? I actualy think that Hatestrike from Naxx 10man is a better off-hand since that one gives 9 less hit rating but a lot more crit rating though. I prefer a nice hit rating and a lot of crit so for me Hatestrike is better. But if you go for the max hit capp its a nice sword indeed! The sword is really nice for Pre-Raiding content for Rogues(I guess other Classes also). But if you have doing 10man Naxx - You should be able to be have good enough gear to start Pugging 25man Naxx. You can kill Anub'Rekhan.You can get Webbed Death (Don't mind the "Feral AttackPower" stat, got changed in the last patch) and be using any MH but mostly a Fist Main hand and Dagger Off-hand (In which is the best setup for a Combat Rogue's and Mute also they can Dual Wield these). The Dagger has higher stats (just 10 less Hit Rating, but slightly more Attack Power a nice 31 Crit Rating, but more Agility which is always good to scale better w/ Greater Blessing of Kings). In which I love the double proc. And yes I know the Sword is BOE but... Still not worth getting over 2.5k IMO, and sure hell it's not the best weapon in the game so not worth wasting the gold if you don't have it. Wow I just got this sword in a lucky mood and sold it without any problems for 2.3Kg to a rogue :). That sure made my day. wow that is a D**K move on your part! i was in a group with a few guys from rockjaw guild the sword popped up we rolled one of the rockjaw guys won and he was very gracious about it! 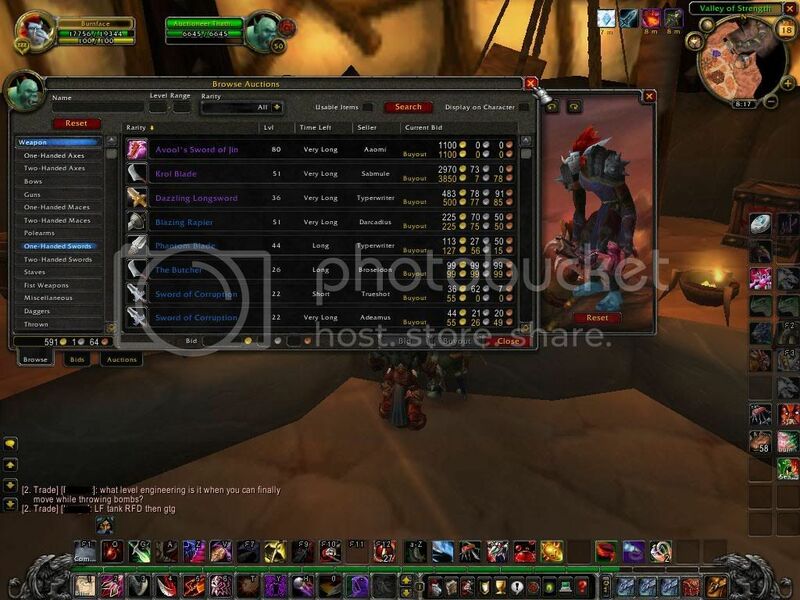 I hope u do something for ur your guildie that u ripped off! and dont say he had lots of gold or that he already had the sword! Bad karma is bad karma! This just dropped for me while doing a daily quest for The Sons of Hodr, Hot and Cold. Was dropped by one of the Brittle Revenants! I was shocked when I got the drop was getting off once I completed that daily and bam surprise surprise surprise. why does every mob on the ''droped by'' have 0%chanse to drop it? often 1000. Right now there is one on the ShC AH for 1000G. you have at least 1600G on you and some patience. The first one I got for 1000G was the bid and not the buy out. and remembered the name. I decided to try and bid. what I wanted to pay and was prepared to wait. No one was more surprised to get it than I was. When I realized it was not unique, I wanted to get a second. My off hand was the Broken Stalactite from SOH. So, I waited and watched the AH. No real deals there. for 1500 or BO. I also knew the name because I had been checking the AH so often and I knew it had been up for sale 3x. The last time it was a 1700 bid and 2200 buyout. I was ready to buy. He came back asking for 1100G. Ok, LOL, that was fine. So now I have 2. At this point in time I think the prices will naturally come down. 1000-1400 is reasonable) be patient and keep checking the AH. Bid on low prices, even if you think someone else will surely have the same idea. It maybe that no one does that day, and you might get it. You loose nothing if you don't. 1100-1400. Or what ever your price is. tired of listing it, and loosing money. and I was the only one to respond. So don't give up if you want this sword, especially now. Put some gold aside and check AH & trade often. If you are iterested in this Sword. you can order it from <itemstores>. Search "itemstores" on google. then enter it and choose it in Weapons--->One-Handed Swords . Here is a 5% discount code:sun. May i make a comment? Mut is the BEST Entry level dps spec in game. Once you start gearing a little more you can break off into Combat and keep up but a Entry level Rogue in Blues as but can do about 20% more dmg. And Dps isn't everything Your damage overall is what you honestly should Look at. i dunno if this has been stated yet but i clocked him at 75 - 85 second respawn, you can kill him maybe 3-4 times before other mobs start to respawn. other mobs are vile torturers witch are nasty SOBS because of there shadow word: pain that does anywhere near 490-510 i am assuming shadow damage every 3 seconds, plus their stackable virulent poison witch deals up to 510 nature damage every 3 seconds. very nasty especially if u get more than one on you. Got mine off of the summoning event in heroic Utgarde Pinnacle. I won our greed roll frenzy. It was goin for 2000g on the AH, and I managed to sell it for 1.8k pretty fast. Great pre-raiding sword for lotsa melee classes, and for mages like me it's great trade fodder. So something for every class, eh? edit: if you're a rogue get the fleshshaper from HoS(better dmg, equal dps, more stats!) and NOT SO RARE! This beauty just dropped off some trash in Storm Peaks while i was doing the Hodir dailies. Dropped for me when I was doing IC dailies.Decided to equip it right away instead of selling because it also makes a great wep for a hunter if you are lacking hit. very very rare drop, spent a whole night for it. ah that part is a wow! Can you guys tell me where to get this item? I've practically searched everywhere. I got this drop from an Onslaught Gryphon Rider while doing dailies in Onslaught Harbor. I couldn't believe it! There's a saying, though, that if you give 1000 monkies a WoW account, 1 of them will get an epic drop from a non-elite mob...or something like that. This is a very spiky sword. I would only expect for a mace to have that many spikes. I mean, seriously, LOL, they should make a new class of weapon and put this in it. A Maceowrd, because it looks like a mace-sword. How much time on average it takes to farm this sword? As noted from above, this is a random drop from high level mobs. I have seen it drop in both heroic instances and from level 80 mobs in Icecrown. There is a very low chance for it to drop, so the easiest place to farm it is the auction house. This one dropped to me today when I was doing dailies today. From mobs wich need to be killed to receive those essence of ice things. I can't decide whatever sell this or use myself with alt. Ill report back how much I got for it if I decide to sell it. Literally had to do a double take when it dropped from a Frostbrood Whelp. Thank you, little fellow. Is is just me, or is this a bow with a handle? Ill make a new post then because some sucker put minus to my comment. Sold this puppy for 2500g. I just got this off a Valhalas Vargul tonight. Haven't decided what to do with it yet ... I'll either sell it or use it on my secondary spec (my pally is specced PvE Ret/PvP Prot). If I decide to sell it I'm gonna have to hold it for a while. Auctioneer said 1800g (my last scan was last week), and I've regularly seen this on the AH for 2000g+, but by the time I got to the AH to check the current prices, the insane undercutters on my server had the price all the way down to 700g. Ok so I just seen it drop in H CoS...and for some reason I could not roll need on it (I'm a lock). I find it pretty BS that I couldn't roll on a BoE item when everyone else could that was in the group. Did any other cloth characters see it drop and the need roll was grayed out? farmed it off a seething revenant in the storm peaks on about the 20th one Woot! I got this dropped off of one of those Kvaldir people in Hrothgar's landing. Lvl 80s. I was shocked to get this! Just dropped for me in H VH, I rolled need and everyone had a fit about it. Just bought this off the AH for 476g for my newly-80 Combat Rogue. Obviously the auction creator had no idea what it was worth. With Cata coming out soon, this has become devalued. It's selling for 8-900 on my server. Our (as in WoW's) genies are Djinn. However I must agree with the subsequent posts stating that Jin is a troll honorific since it shares models commonly used by troll items and the fact that wow Djinn don't show up until the next expansion. had one in my bags prior to 4.3. Unless i missed a blue post about this, this became soulbound. I can no longer sell it in AH. What apparently wasn't added to the list of things that drop this is a chilled earth elemental in Wintergrasp. I found them to be a good way to farm crystallised earth and ended up recieving this sword. Can't wait till my hunter gets to the level to use it! It looks so cool! A pretty cool xmog sword for a Warrior, Rogue or frost Death Knight in my opinion and since the removal of the original Zul'Aman raid (level 70) in patch 4.1, Blade of Twisted Visions is no longer obtainable, making Avool's Sword of Jin a completely unique model which is extremely hard to obtain. Expect to see it every once in a while at your local AH at a very high price. It's been on the Horde AH on Boulderfist for several days for 12,850g. The seller is the type who has all sorts of various epics up all the time, usually for what I consider stupidly high prices. I like to 'mog a little but not enough to fork over 12k for an otherwise useless piece of gear. Sold it today for 25k, thought it is a nice price, lol, for a realy nice sword. I just got this in the AH from a bid for 91g. After looking up the buyout price, I decided to start bidding on it. Took a few hours but the other bidder finally gave up. Hoping I can sell this for 2-3k. We'll see. Just dropped one of these from a Big Crate of Salvage. Did you just mess up your blade with 1 swing of the hammer? Think you just wasted all that time and gold just to add something to the disenchant pile? Well there is no need to fear! Just add a few zip-ties and some skulls and BAM, people will go crazy for your new creation!